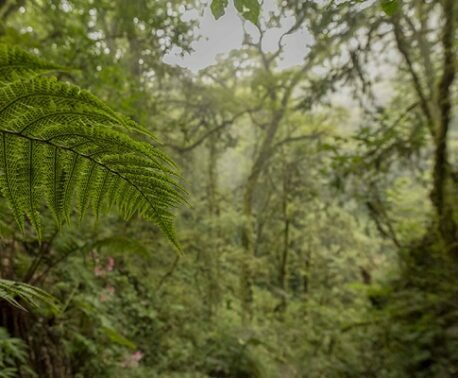 Dense forest and high altitude ensures that photographing wildlife in Sierra Gorda Biosphere Reserve (SGBR) isn’t easy. A narrow miners´ path is the only access to the greatest heights of SGBR. Mounts are covered with pines, oaks, and firs on this sky island, bordered on the west by the semi-desert and on the east by tropical forests. It was in the month of June when by chance I noticed the large yellow flowers that stood out among the pines and oaks along the main road to the state capital and immediately thought of hummingbirds being attracted to the flowers; so I returned with the camera and lenses to see what I could find. Although I have visited that area multiple times for many years, each time has been spectacular and has yielded excellent surprises, but in this case it was tremendous. After 25 minutes of climbing in the jeep by the narrow breach, and already at above 3,000 meters with a cold wind despite it being summer, I found among ancient pines and oaks a magnificent group of agaves in bloom, with stems five meters in height that could scarcely support the weight of the large clusters of flowers – and many hummingbirds! Birding can be quite a tricky activity, but luckily not in this case; after only a few minutes they accepted my presence (I knew from previous experience that hunger can be greater than fear with these birds), and they resumed their activities of attacking the flowers, up to 25 birds of four species feeding at the same time. That ceremony starts from sunrise and continues until dark, since the rapid metabolism of the hummingbirds and their energy requirements lead them to feed continuously on the nectar from flowers, on which their diet is based, supplemented throughout the winter with small insects. 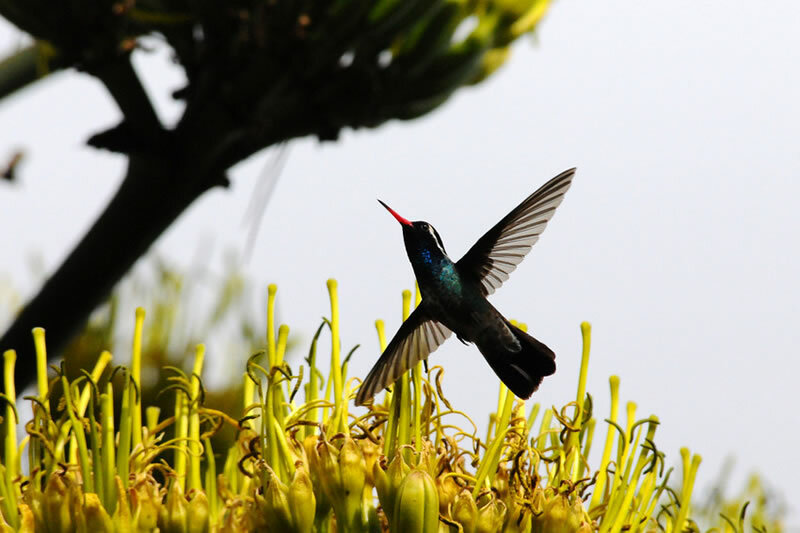 From the bumble-bee hummingbird, a Mexican endemic and the second smallest bird in the world, to white-eared, blue-throated and magnificent hummingbirds, they gathered for a show that was an unexpected and unique opportunity for photographing them. Although this is a real challenge; they fly at an incredible speed, are aggressive with each other, and do not stop moving from flower to flower. So it depends on good light, a wide aperture, fast shooting speed and a good telephoto lens to capture them and arrest their frantic flight. Without doubt, this was a unique spectacle that shows one more facet of the Sierra Gorda where we are obliged to undertake every possible effort and activity to protect the unique biodiversity in central Mexico. These birds and many other species are protected in the SGBR in private nature reserves, established with the support of many individuals, or our international partners the World Land Trust. The agave plant has been particularly important in Mexico since pre-Hispanic times, providing a variety of fibers for weaving and rope-making, and its leaves for roofing. It was even used in Aztec religious ceremonies. Nowadays it remains a source of several alcoholic beverages such as mescal, sotol, pulque, and the world-famous tequila. These products would not be available without the work of a variety of pollinators, both insects and birds, particularly hummingbirds. 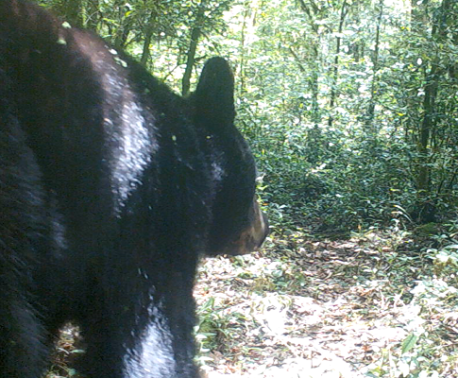 Find out more about WLTs work with GESG on the Sierra Gorda Biosphere Reserve Project Page.